The Position Light: Better Know a Signaling System: Amtrak "CPLs"
I know what some of you are thinking. Isn't Amtrak part of NORAC and aren't those colorized position lights part of their signaling system and not Amtrak's? 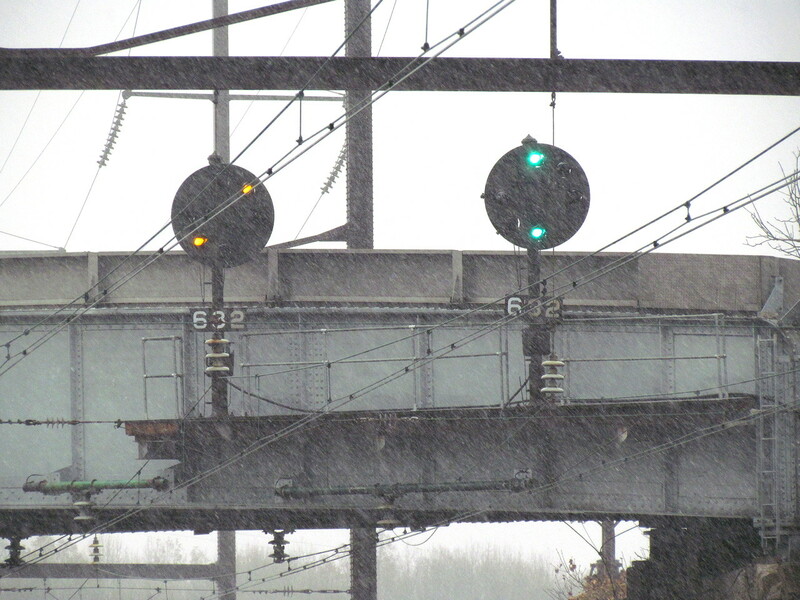 Technically that is true, but the colorized position light was always Amtrak's baby and aside from a single Conrail trial automatic block location near Columbus Ohio, colorized PRR position lights haven't been adopted by any other railroad. Another misconception is the entire Color Position Light or CPL label for Amtrak's system. CPLs are what the B&O came up with as each signal relied on both color and position (of the orbital) to derive its meaning. 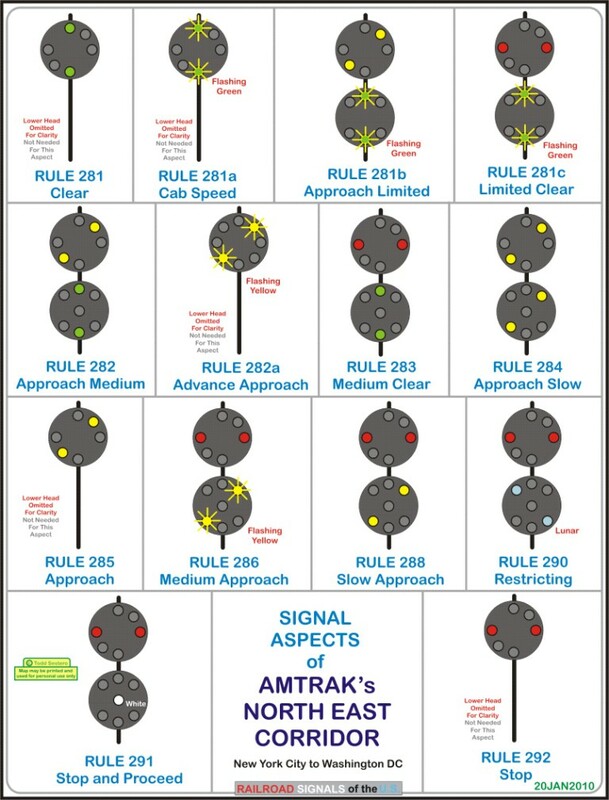 Amtrak was aware of this distinction and after slapping a bunch of color filters on amber PRR signals and eliminating the center lamp they christened their invention "Position Color Lights" or PCLs. I call them Colorized Position Lights (CzPL?) because I find the term Position Color Light to be rather pretentious. 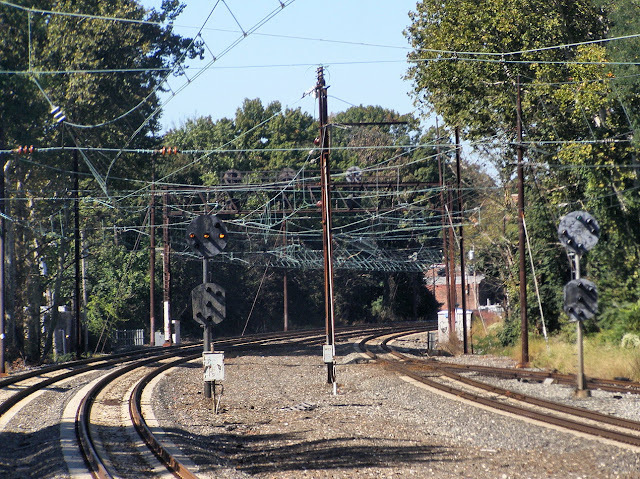 Found on Amtrak's electrified system from New Rochelle to Washington, DC and all the way out to Harrisburg, the CzPL is either a long overdue update of the former PRR system or a short sighted overreaction to a problem that never existed. Position Light colorization began as a response to the Chase, MD wreck based on a finding that the all-amber position lights were not salient enough. Considering the crew of the Conrail train that missed the signal were all high on pot, I'm not sure color would have done much to rectify the situation. In fact many charged the colorization made the signals far less visible, especially in the poor light conditions the amber PLs were designed to excel in. However use of LED light sources have completely eliminated the visibility problems and now the CzPLs are as good as anything that existed in the amber era. If you are wondering why Amtrak never just cast its lot with color light signals I have heard it is a combination of wanting to re-use old hardware, to avoid needing crews to get used to a new normal and finally, PLs work better in electrified territory with overhead lines and support structures that can momentarily block out single lamp signals. From my personal observations this is indeed an issue on the Shore Line with color lights winking in and out of visibility. LED CzPLs certainly pass the snow test. 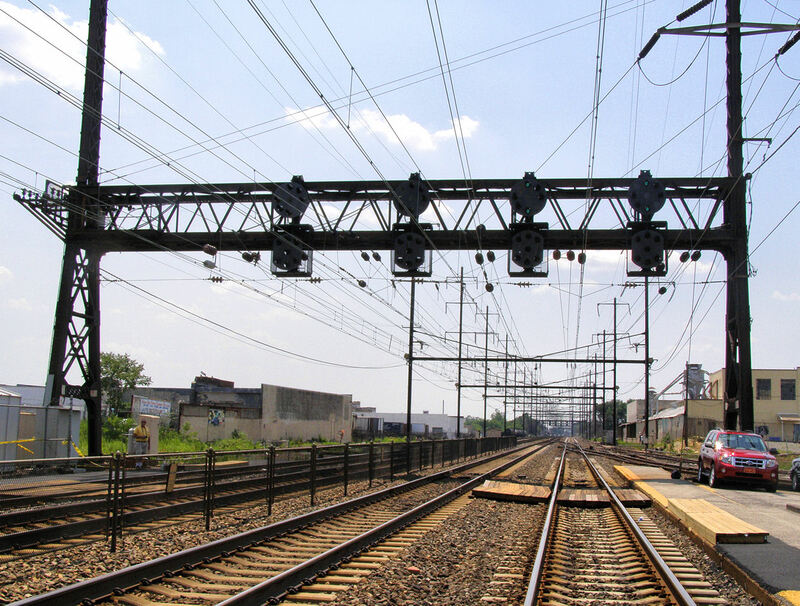 The last amber PLs were installed by Amtrak in the mid-1980's on the Hellgate line, at the new PHIL interlocking and at FRAZER interlocking on the Harrisburg Line ~1994. Apart from those locations amber PLs only survived on the Harrisburg Line and un-resignaled portions of the corridor. In terms of interesting features the only two anomalies are the use of a central lunar white lamp on the lower head for Stop and Proceed indications, which under NORAC are still distinct from Restricting indications. This allows the lower head to avoid the gaping blank spot the upper head has to contend with. Also the flashing green | for Cab Speed was not replicated on amber PLs since I guess the NORAC committee no new interlockings would ever revert back to the amber system, especially not ones with high speed turnouts. 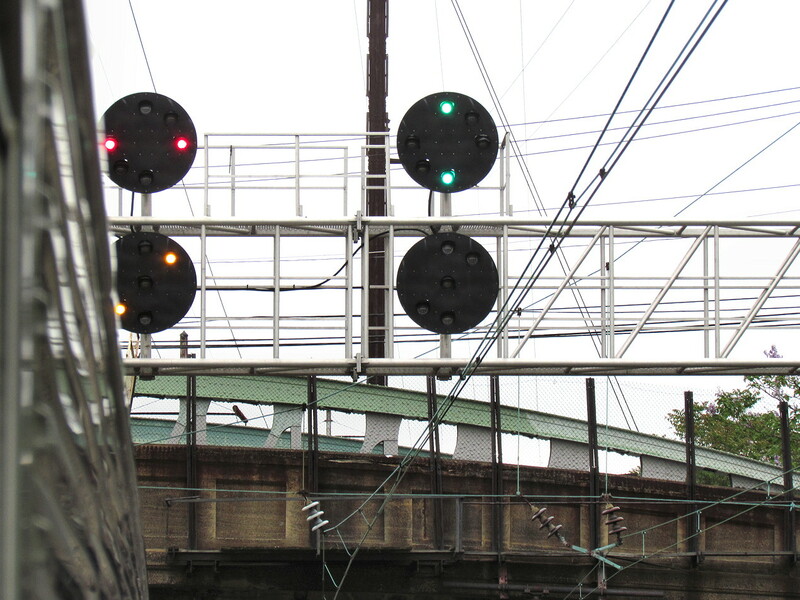 New signals, new RGY colors. So that's the history of Amtrak's colorized position lights. At some point I'll do a "gotta chatm 'em all" post, but I believe I am missing videos of both the flashing green | Cab Speed and the flashing / Advance Approach. Advance Approach is likely the hardest signal to find seeing as how the PRR preferred using Approach Medium for short signal distances. However they do show up on the 6-track raceway between UNION and ELMORE on the outside local tracks.